Pushups provide no impact to your joints and are easy to include in circuit training. Circuit training is an effective way to keep your workout from growing stale; instead of spending most of your time on one exercise, you can include a variety of exercises and move freely from one to the other. Effective circuit training includes stations that work your entire body, and if you suffer from sore joints, adding low-impact stations to your routine is ideal. It's easy to develop a solid workout regimen without thinking about stretching your muscles, but adding a stretching station to your circuit training will loosen your muscles, make you more flexible and reduce the risk of straining a muscle during one of the more rigorous stations. A bonus is that stretching doesn't involve any impact to your joints. Focus on stretching your arms, shoulders, hamstrings, quads and hips to limber up for your circuit training. Pushups and situps might not be the most exciting addition to any workout, but they're so common because they work. Pushups strengthen your core, chest, arms and back, while situps target your core and hips. A perk to these workout mainstays is that they're low maintenance; you don't need any equipment to get a sweat going. The number of reps and sets you do is up to you, but the more you can manage, the faster you'll see results. If you set up your circuit training so that you spend just a couple minutes at each station, cycling can be a hassle. But if you want to devote five to 10 minutes per station, cycling provides a cardiovascular workout while also building the muscles in your lower body. It's best if you're doing your circuit training in an area with a track suitable for cycling. Depending on the length of the track, the cycling station could involve 10 or 20 laps. 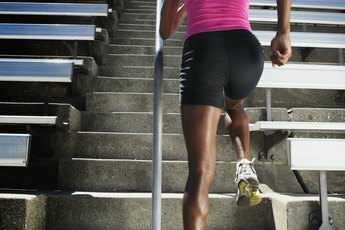 Few exercises provide the calorie-burning benefits of stair climbing, and if you have access to a set of stairs, this exercise has a low impact on your joints. An hour of running up a set of stairs will help a 130-pound person burn 885 calories. If you break this station down into just five minutes, you'll still be able to burn roughly 74 calories in that short duration. The key to keeping stair climbing as a low-impact workout is to descend carefully, keeping your knees bent to absorb the shock. If you've got access to a pool and don't mind taking a couple minutes to remove your shoes before jumping in, swimming lengths is a perfect impact-free exercise. 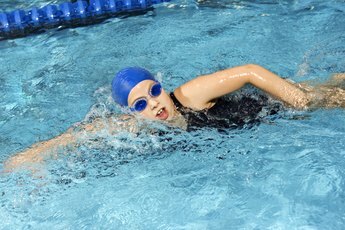 The stroke you choose depends on your strengths as a swimmer, but regardless, you'll burn plenty of calories. 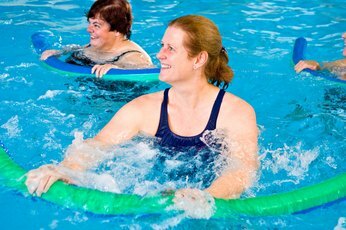 Thirty minutes of slow freestyle swimming will help a 130-pound person burn more than 200 calories, and strokes such as sidestroke, breaststroke and butterfly burn even more.